Tonkotsu Ramen Recipe - This broth is milky white and unctuous, thanks to pork marrow bones and fat cooked for hours. Make your own Tonkotsu Ramen at home. This post may have been a year in the making, but I’ve been working on this tonkotsu ramen for the better part of the last decade. In case you haven’t been indoctrinated into the wonderful world of ramen, Tonkotsu broth is the Holly Grail of noodle soup broths. It’s thick, creamy and nearly white in color, from pork marrow bones that have been simmered to smithereens. 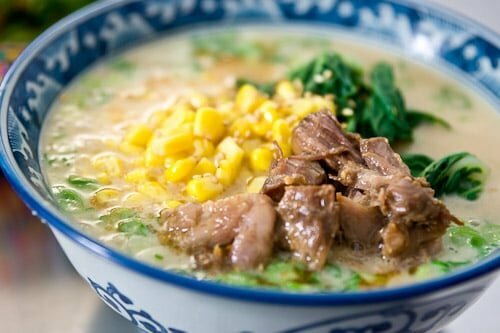 Given the availability of reasonably good frozen ramens, and the plethora of shops specializing in the one bowl meal, most sane people in Japan don’t undertake the challenge of making ramen at home from scratch. I don’t know if I’m just crazy or if it’s my fearless American spirit, but at some point in college, it occurred to me that I could make the one bowl wonder that got me through many an all-nighter… from scratch. My first attempts were pale watery excuses for ramen. Actually, they were more like noodles in pork soup. Over the years, my attempts yielded broths that were too porky, too brown, or too canned-meat tasting. Eventually, I got the soup to a place where you could pass it off as ramen to the less experienced palate (which was when I started writing this post), but it never quite nailed the nuanced balance of meat, aromatics, and body. So how did I figure it out? During my recent trip to Japan, I had many bowls of ramen, each with its own distinct character and personality. Some used chicken stock, others included pork. I even had one ramen that was made of tuna stock. I think I was in the middle of a bowl of chicken consommé ramen with bacon, mozzarella and fried burdock on top when it occurred to me that perhaps limiting myself to a 100% pork broth wasn’t the right approach for the type of stock I was trying to create. I had another epiphany at Ramen Stadium, in Fukuoka, where I hopped from restaurant to restaurant, gorging on Tonkotsu Ramen. Many of the broths had a dark oil that I’d always assumed was sesame oil. Upon closer inspection, some of the soups revealed caramelized bits of onion that were nearly burnt. The research of Louis Camille Maillard came to mind and I realized that a lot of the nuances in the broth were not coming from the meat, but from the caramelized aromatics in the broth. Back at home, with bags of chicken and pork bones in hand, I set to work recreating the flavors and memories while they were still fresh in my mind. And the results? Well, let’s just say I won’t be standing in line for hours outside Ippudo this winter. To say it’s better than Ippudo’s would be a stretch, but does it make your lips sticky with collagen? Yes! Does it have little creamy nibbles of pork fat floating in the broth? Certainly! Does it put a big grin on your face when the steaming bowl is set in front of you? Hell yea! The toppings are up to you, but I usually go with the standards like chashu, menma , woodear and scallions. If you want some chashu similar to Santouka Ramen’s Toroniku, here’s a recipe for my version. To give a Kagoshima flair, I finish each bowl, with a drizzle of mayu (black garlic oil). It’s technically burnt garlic and it’s not something you’d want to eat alone, but mixed into tonkotsu ramen, it’s divine! This recipe makes enough Tonkotsu base for 6-8 bowls of ramen (depending on how much water you add), and the Tonkotsu Ramen recipe below makes 2 bowls. Next, I need to find some kansui so I can tackle the noodle making as I’m not super happy with the noodles I get in Chinatown. Fill a pressure cooker 2/3rds of the way with water and bring to a boil. Add the pig trotters to the boiling water and cook until you stop seeing red blood come out of the bones (about 10-15 minutes). The idea is to draw out as much of the gunk as possible into this first batch of water. Transfer the trotters to a bowl of cold water then repeat with the leg bones and chicken bones (you can use the same water). Dump the now very dirty water down the drain and wash the pot. Scrub any dark brown scrum off all the bones and rinse them thoroughly. Return the cleaned bones to the pot and cover with water (the water should come up an inch above the top of the bones). Bring the pot to a boil and skim off any chunks or foam that floats to the surface. Keep doing this until you don't seen any more foam or scum floating up. This will take about 30 minutes. While the bones are going, Heat 1/2" of oil in a pot over medium heat and add the head of garlic and ginger. Fry this until they are browned and shriveled up. Use a slotted or wire mesh to transfer the ginger and garlic to a bowl. Add the onions to the oil and fry these until caramelized and shriveled. Add the fried onions to the ginger and garlic and set aside. 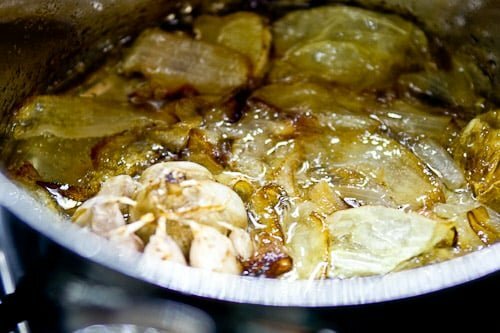 Once the stock is scum-free, add the caramelized ginger, garlic, and onions, along with the white pepper to the stock. Affix the pressure cooker lid and cook on high pressure for 1 hour and 45 minutes. If you don't have a pressure cooker, cover with a lid and cook at a boil for 5-6 hours (you may need to check and add water periodically, the bones should be mostly covered in water). Once the pressure is released use tongs to remove and discard all the bones. Remove any chunks of pork and set aside for another use. Strain the stock into a bowl and skim off any excess fat. To make the black garlic oil, add the sesame oil into a small saucepan along with the grated garlic. Put the pan over medium low heat and let the garlic cook stirring occasionally until it is very dark brown. When the garlic is very dark, turn the heat down to low and let it cook until it is black. As soon as it hits black, turn off the heat and transfer the hot oil and garlic to a heatproof bowl. Let this mixture cool down completely. Add the cooled oil to a blender or food processor and blitz until there are no visible garlic particles left and the oil is uniformly black. It will taste burnt and slightly bitter, but this is okay as you only add a little bit to each bowl. Put it the oil in a container and refrigerate until you are ready to use it. Heat the tonkotsu base in a sauce pan. In a bowl whisk together the tahini, chashu liquid, grated garlic, salt, mirin and white pepper. Add this to the hot broth and whisk to combine. Taste and adjust salt as needed. Bring to a simmer, then add the sesame seeds and pork fat and whisk to combine. Split the cooked noodles between two bowls. Pour the tonkotsu soup over the noodles. Top with chashu, scallions and whatever else you want to add. Finish the ramen with a drizzle of mayu on each bowl. To get the creamy white soup it’s important that you use pork leg bones and the trotters. The white color comes from the marrow and collagen in these parts. Using other types of pork bones such as ribs or neck bones will not give your soup the richness or color. Don’t omit the fatback (salted pork fat). Most of the fat from the stock gets skimmed out, and the fat added at the last minute is what gives the soup it’s rich “sticky” quality. 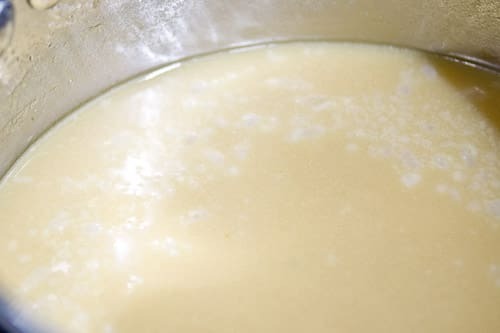 By whisking small bits of minced fatback in at the end, you create an emulsion of soup and fat, so it makes the soup nice and creamy without being greasy. If you’re having a hard time finding it, try asking for it at a butcher. The onions should be a deep brown, but they should not be burnt, if they are browning unevenly, turn the heat down, so they brown more slowly. Tahini is not the same as toasted sesame paste. It should be light beige in color and have a thick pourable consistency. If your grocery store doesn’t carry it, try finding a Middle Eastern or Indian grocery store. I use a brand called “Al Wadi” that comes in a plastic container with a green label and lid and has a relatively mellow flavor. If you can’t get tahini you can also grind your own sesame seeds until you have something resembling runny peanut butter. Salt has different levels of salinity depending on the type and brand. Even amongst kosher salt, Morton’s for example is much more salty than Diamond Crystal (which I use). Most recipes deliberately go low on the amount of salt you should use so you don’t accidentally over salt your dish. If you feel like it needs more salt, by all means, add more salt. Wow!!! I am so in love with ramen but sadly am unable to find anything remotely authentic to what I had in Japan where I am in the US. I am so glad you undertook the difficult task of trying to brew up some of this delicious stock so the rest of us may have an easier time recreating those wonderful ramen slurping memories. Thanks!!! My husband will kiss the ground you walk on. This is one of his fave things in the world. I want to just slurp up a giant bowl of this right now. The best ramen I had was in Honolulu! After a heavy night of drinking it was the perfect cure. I still remember the taste! Marc it looks like your quest for the perfect ramen has been fulfilled. If I ever get adventurous I’m sure to look it up and give it a go. All the best for 2010…It was a real pleasure meeting you later this year. If it’s close to Ippudo’s ramen then its definitely worth a try. I’ve never made ramen at home, but will be making this one soon. Congratulations! Now there’s an accomplishment to truly let you know that 2009 was a successful year! WOW. This is a real revelation. Thanks for sharing the insight into the making of a good bowl of ramen! Here’s to wish a great year in 2010!!! Happy New Year! Definitely making this! Happy New Year! Congrats on the level of your dedication. I know the quandary of saving your best posts until they’re perfect; I’ve got 5-6 patiently waiting! Beautiful job. I’m looking forward to the upcoming noodle post – I think noodles are perhaps the most “avoided” area among home made foods, even though they are so loved. May there be many bowls of ramen in 2010. Sounds amazing. I like your choice of toppings too. Very colorful. That is one nice looking ramen! Great tips for making the broth! Unbelievable – just stumbled across this on a web search and it’s exactly what I’m looking for. Thanks so much for taking the time! And shares with his friends. Man, you are the super foodie! A touch crazy, I do think (In the right way, of course!) I think I would like to try making ramen broth, but maybe not. You inspire me. How was tuna stock, and where did you have it? The ramen with bacon, mozzarella and fried burdock is pretty great, I think. But tonkotsu is the real deal. congratulations on the herculean effort. tampopo would be proud. i love posts that i spend time thinking through and editing. sometimes it isn’t straight to press for my recipes. I am nursing a xiaolongbao redux recipe, culling the texture of skins and flavors, consulting others, in order to rpoduce something i love. fantastic! a goal to make homemade ramen has been on my radar for AGES. now, i must learn to make the noodles. This seems like a stupid question, but any advice on the best way to get the chicken bones? Surely there must be an easier way than deboning multiple chickens…. I’ve been searching the web for a while for a great tonkotsu recipe, and this is it! Brilliant post, thanks for the inspiration. 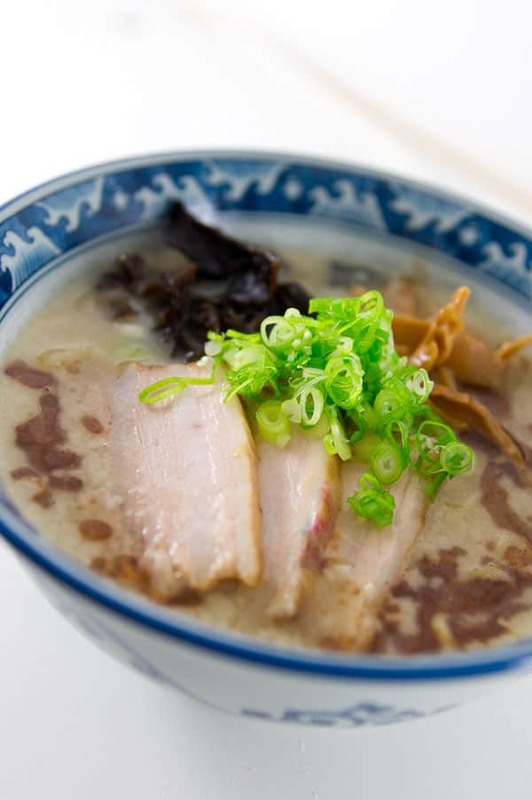 I've been searching the web for a while for a great tonkotsu recipe, and this is it! Brilliant post, thanks for the inspiration.